these are a few of my favorite things, travel edition. Oprah has her favorite things. So do I. We all have certain things, certain foods, places, and even people that enrich our lives and make us infinitely happy. Travel makes me happy. I love the thrill of discovering a new place, new foods, getting good deals on souvenirs, and finding new things that make traveling a bit easier. This year has been about expanding my horizons, gaining new experiences, and learning more about the world and my role in it, and I’ve picked up a few new favorite things that made all of this a bit more special. Over the next few months, I’ll feature products that make my traveling easier and more enjoyable. This first list is quite basic, but handy. Below is a list of things I cannot leave my house without. 1. 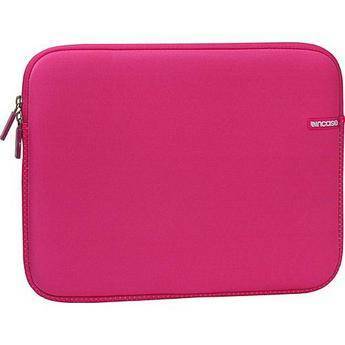 InCase 15″ Neoprene Sleeve in Magenta. I’m an Apple girl. I’m pretty sure I’ve mentioned it once before. Anyway, where I go, my Mac goes. I’m rarely without it, be it a trip to Starbucks, or visiting friends out of state. Being highly accident-prone generally spells calamity for things I own, especially my laptop, so being able to protect it while I’m out and about is important. After adding yet another ding to my computer during my Las Vegas trip in July, I decided that enough was enough, and the day after I got back, made an emergency trip to the Apple store. I didn’t know what I was looking for exactly, but I knew that I had to get something that would keep my computer safe during my travels. A fellow customer actually recommended getting a neoprene sleeve, and after asking a Concierge if this soft case would actually protect my laptop better than the hard ones I’d been eying, I bought it. And, I’ve never looked back. It maybe soft to the touch, but it absorbs shock like a hard-shell case, and doesn’t scratch the laptop. The interior reminds me of lambskin, but it’s just thick cotton. I got mine for about $50, but you can find it for much cheaper at retailers like Amazon.com. 2. The North Face “Jester” Backpack. I kind of knocked my old Jester backpack in the review for backpack that GoLite sent me, but I love it. I first bought it in summer 2007, when I was too broke to afford one of the trendy North Face jackets. I was tired of lugging my books around in the Jansport messenger bag I’d bought earlier that year, and needed something durable to hold my stuff in as I flitted across campus. Despite the large cult following that The North Face has among college students, the company specializes in products that are better suited for outdoor activities such as climbing, running, and hiking rather than hauling books to an 8:oo A.M. comparative politics class. My Jester backpack and I have been together for three years now, and it’s as strong as it was the day I bought it near the small sports supply near my alma mater. I’ve carried textbooks, groceries, Christmas gifts, wine bottles, and candles in it, and it’s still standing. I love to travel, but I hate airplane cabins. I think most people do. There’s just something inherently uncomfortable about airplane seats, especially if you’re sitting in coach. Whether it’s the how often the small child behind you kicks your seat to the Chatty Cathy in the seat next to you, most flights are a pain. Adding insult to injury is the fact that most airlines now charge their guests for pillows. Growing up, a pillow and blanket were free on domestic flights and most international flights, but this is no longer the case. These are sad realities of airline travel, but there are things you can do to make it more bearable. I can’t set foot on a plane without my REI travel pillow. Heads will roll and I’ll be primed to whine and complain for the whole flight if I forget it at home. It’s big and plush, and supports my neck, and if I position myself just right, I can fall asleep peacefully as Chatty Cathy drones on about her cats and the miniature David Beckham gets his kicking practice in. I know, I know. Stop rolling your eyes at me. But given the number of people we come into contact with on a daily basis, it’s important to give our immune system a break and stop germs in their tracks. This is especially critical for me when flying, or while out seeing the sights on vacation. It’s just something I have to have where ever I go. Make sure your hand sanitizer is alcohol-based, with at least a 60% alcohol concentration. I recommend Purell. I have dry skin, and the recycled air on airplanes is not kind to it. By the time I reach my destination, my skin is drawn and taut from the lack of moisture. 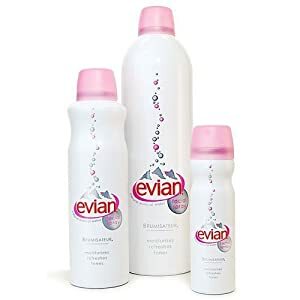 I mentioned this annoyance to a fashionista-turned-globetrotter friend of mine, who recommended the Evian spray. I was somewhat skeptical of what mineral water could do for my skin, but I was soon proven wrong, as the spray thoroughly brought my skin back to life during a layover in Nashville. The dryness and tightness were instantly gone, and I even spritzed the lady who had been seated next to me on the plane with it. It was definitely what I was looking for, and I think most women (and very fashionable men!) will appreciate the boost you get from using it. And thus concludes my first Travel Favorites post. I hope this list will help guide you in making purchases for your next trip! Also, a note about the GoLite giveaway….if you subscribe to the blog, please remember to e-mail me with your name and e-mail address so I can identify you when the contest ends in January. Your entry won’t count otherwise.girlandth3city at yahoo.com.